Are you sitting comfortably? 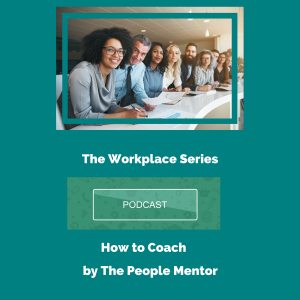 Welcome to my series of podcasts that will help you to navigate those inevitable difficult events at work that are part of being a manager. Today I want to talk about how to coach. Coaching helps employees to take charge of their own development. It helps promote insight into behaviours and performance, helps an employee learn about themselves, and empowers them to make beneficial changes. Coaching is about helping an employee see their potential and take ownership of their personal development. Whether an employee needs help with a current work or personal issue or a longer-term career issue, an effective coach will help them to explore possible solutions, develop new goals, and support them while they are putting any agreed changes in place. Good managers and leaders don’t just discipline or micromanage employees, they support them to reach their goals; this is coaching. Helping employees to understand their responsibilities, your expectations, and the reasons why they might not be meeting their goals is a big part of being an effective coach, as well as providing employees with valuable feedback and advice so they know where they need to improve. Being an effective coach also involves trusting employees to improve their performance and to proactively work towards growth, which will increase their productivity and independence. So, let’s look at how to effectively coach employees. One of the most important things is that you should aim to build trust. Employees need to know that you want to help them succeed and that you’re not just waiting for them to slip up, so you can discipline or fire them. There should be open channels of communication and mutual respect. If an employee feels able to be open and honest with you, they might feel comfortable being honest about something that has led to a drop in performance, such as problems at home. It’s far easier to work together to come up with a solution if an employee feels able to talk to you without being judged. To add to this point, an effective coach asks questions. So if an employee tells you they are going to miss a deadline, then tells you why, rather than dismissing the reason and telling them they must meet the deadline, try asking them about why they’re going to miss the deadline and really listen to their answer. They could have a genuine personal problem going on. As well as asking questions, why not encourage the employee to come up with answers to their problems? This is much more empowering than being told what to do, and it might help employees know what to do if the situation ever happens again. The next thing is coaching is not the same as a performance review. When you meet with an employee, explain that coaching is about providing feedback and support, it’s not about judging their performance. Employees are likely to receive what you so much better once they understand this. If you do need to discuss a performance issue with an employee, discuss it in terms of problematic behaviours instead of making it personal. This way, you can get a feel for how the employee views their behaviours and if they agree that there’s room for improvement. If you’re both on the same page, this is a far better basis for moving forward. From here, you can work with the employee to come up with solutions to remedy the performance issues or problematic behaviours. If they have had some input to come up with solutions, it makes them accountable and responsible for improving their own performance. This doesn’t mean that you have no further role, however; you should ask the employee how they want to be supported to meet their goals. This might be offering mentoring, training, or having a weekly progress meeting to see how they’re getting on. Providing feedback to employees is crucial, and it’s not just about telling them they’ve done a good job. Be specific. If an employee dealt with a difficult customer well and resolved a complaint, tell them. Then they’ll understand what kind of actions receive good feedback and this will hopefully lead to a desire for further growth and improvement on the part of the employee. So we’ve discussed how to coach, but what is the actual value of coaching to an organisation? It can be time-consuming, but there are many benefits. It can show an employee that you care about them and you want them to be successful, and this, in turn, will make them more motivated and productive. It also promotes feelings of trust. By coaching effectively, you can also spot performance issues quickly and resolve them before they get out of hand. Better performing employees equals a better performing business, and that is why coaching is a major tool in any effective manager’s arsenal. I hope that you got some good tips from today’s podcast, and I’ll see you next time.